Groups say comments about TV station create "atmosphere of intimidation"
Government agency says Globovision report on earthquake generated "alarm, fear"
(CNN) -- The United Nations and the Organization of American States said Saturday they are worried over Venezuelan government statements about an independent TV station that has criticized President Hugo Chavez. 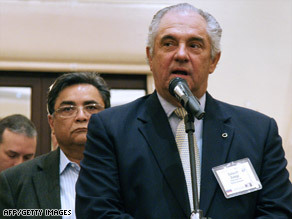 Guillermo Zuloaga, seen in 2008, is head of Venezuelan TV news network Globovision. In a joint release, freedom of expression investigators Frank LaRue of the U.N. and Catalina Botero of the O.A.S. "express their concern in light of the statements made by the highest-level government authorities, which generate an atmosphere of intimidation in which the right to freedom of expression is seriously limited." "We reject and condemn use of the name of such institutions as the U.N. and the O.A.S to attack member states while defending private monopolies that are accustomed to abuse of power and violating human rights," said Venezuela's U.N. Ambassador Jorge Valero. At issue is the Globovision TV station, the sole remaining national broadcaster in Venezuela that is openly critical of Chavez. The government has opened an investigation into whether Globovision broke the law on May 4 when it reported about an earthquake before an official report had been issued on the matter. "During the broadcast, the network's director noted that the quake had caused no serious damage and criticized the fact that official information had not been provided in a timely manner," LaRue and Botero say in Saturday's statement. "Since that news report," they later add, "Venezuela's highest-level authorities have publicly accused the privately owned media, and particularly Globovision, for resorting to 'terrorism' and 'hate speech' with 'destabilizing intent.' "
An agency that reports to Chavez began administrative proceedings against Globovision three days after the broadcast "on the grounds that the information provided to the public on the occasion of the quake could 'generate alarm, fear, anxiety, or panic among the population, giving individuals the feeling that they are in danger and without protection,' " the statement says. It is the third government investigation of Globovision. A decision is expected soon, leading to the possible revocation of Globovision's license. It wouldn't be the first time for an independent station. The government did not renew the broadcast license for RCTV, another independent broadcaster, two years ago. The station had to go off the public airwaves and transmit solely on cable. Other TV stations seemed to get the message, a watchdog group said. "Televen and Venevision hung on to their frequencies by adjusting their editorial line," the Reporters Without Borders press organization said in its 2009 World Report, referring to two national TV stations. "Globovision alone kept up its criticism of the government." On Thursday night, Venezuelan police and federal authorities conducted a massive raid at a home belonging to Globovision's president, Guillermo Zuloaga. Officials said they were conducting a car-smuggling investigation. Zuloaga, who was not charged or arrested, said Friday officials were trying to frighten him into silence. The 24 vehicles in question, he said, were legally acquired through a Toyota dealership he owns and were in the process of being turned over to their new owners. "They took advantage of the situation to try to scare me," Zuloaga told CNN en Español. Speaking on national TV Friday, Chavez said there was no political motive behind the raid. Without mentioning him by name, Chavez said Zuloaga was violating the law with so many cars parked at the estate. "The owner of the house at the same time owns a television channel," Chavez said. "They believe they are exempt from punishment because for them there are no laws. They start to say that Chavez is persecuting them. No, no, no. They are violating the law and we have to end impunity for all time." Some analysts are not so sure that was Chavez's intent. "It certainly appears as if it's one more step toward asserting authoritarian control over the country by intimidating the media," said Robert Pastor, who was national security adviser for Latin America under President Jimmy Carter in the late 1970s. "It's hard to know if there's any justification for this action," Pastor said, "but given other steps he has taken against legitimately elected opposition and fundamental institutions of the state, it's fine for the international community to ask if this is based on legitimate concerns or if it's one more effort to dominate the politics of Venezuela." Independent groups have said Chavez has systematically brought other institutions under his direct control, including the judiciary, congress, the central bank and the powerful state petroleum company. Chavez has a long, antagonistic relationship with TV stations, newspapers and other media, many of which have been harshly critical. "For the most part, the media is not part of the loyal opposition. They are the lethal opposition. They are always looking for Chavez's jugular vein," said Larry Birns, director of the Washington-based Council on Hemispheric Affairs policy institute. Chavez's efforts to push back appear to be paying off. "After years of 'media war,' Hugo Chavez and his government took control of almost the entire broadcast sector [in 2008]," Reporters Without Borders said in its 2009 report. Thursday's raid was carried out because an "important group of hidden vehicles were found," police Chief Wilmer Flores Trossel said. "These vehicles have serial numbers that must be identified to establish their legality, their condition and their documentation," he said. Investigators obtained a judicial order before undertaking the raid, Flores Trossel said. Video of the raid shows a chaotic scene, with people shoving and trying to talk loudly over each other. Perla Jaimes, a Zuloaga attorney, tried to stop officials from entering the compound through a narrow gate. "You have to respect what this order says, which means we have to read it together," Jaimes can be heard telling an official. Both clutched copies of the court order, waving them at each other. Later, the gate door opened forcefully, hitting Jaimes while she stood with her back to it. She stumbled forward as a man was heard complaining that more care must be taken with a woman. Venezuelan officials said Friday they have opened an investigation to see whether Jaimes or others at Zuloaga's home obstructed justice when they tried to stop the raid. Zuloaga said in an interview on Globovision Thursday night that 100-150 police officials took part in the raid "instead of taking care of the streets of Venezuela, which are so dangerous." The station delayed broadcasting images of the raid for almost an hour because it happened as Chavez was delivering a televised address about his plans to nationalize certain businesses. Venezuelan law says Chavez's speeches and official acts must be carried live and in their entirety or else the stations face a fine or suspension. Official broadcasts "are sometimes devoted to commemorations, more often to propaganda and almost always to diatribes against the enemies of the Bolivarian revolution," according to Reporters Without Borders. "Hugo Chavez made 1,816 of these speeches between the date of his first mandate on 2 February 1999 and 19 December 2008, talking for a total of 1,179 hours, equal to 49 full days."